One day, Ah Ji accidentally dropped a stick that just hit a rabbit on its lower back. He was shocked and scared that his boss will deduct his salary, so he quickly hid the rabbit in a bean patch. A couple of days later, the rich man noticed that one of the rabbit was missing and asked Ah Ji where it was. Ah Ji had no choice but went back to the bean patch and looked for the rabbit. He was surprised that the rabbit looked well and was jumping around. He thought: “The rabbit must have eaten something. How come an injured rabbit have the energy to run around like this? That's very strange!” Ah Ji tried to grab the rabbit, but the rabbit run so fast that Ah ji couldn't get it. Afterwards, Ah Ji went home and told his father what has happened. His father was cruelly beaten by the rich man a few months ago, and his lower back was hurt seriously. He even couldn't go to work for those days. After Ah Ji told his father what happened to the injured rabbit, his father was curious about what the rabbit ate. He even thought it probably would be good for his back. Therefore, he asked Ah ji to find out the truth. Ah Ji went back and struck another rabbit on its back, and put it in the bean patch to see what would happen. In the beginning, the injured rabbit couldn't move. It stretched its neck and nibbled the seeds of a yellow plant that clung to a bean stalk. Three or four days later, the rabbit recovered miraculously. Ah Ji thought happily: ”If the seeds of the plant can heal the rabbit's back, they could have the same effect on people!” Ahi ji's father heard this and said: “Go and pick some seeds of the yellow plant, and decoct them as medicine for me to drink.” The father drank the medicine; a few days later, he could leave his bed and move around. Two months later, he could go back to work on his fields. As a result, Ah Ji left the rich man's house and devoted himself to gathering the seeds of the yellow plant and making them into medicine. He distributed to people who suffer from back pain. The seeds had great effects and the back pains of many people were cured. Due to this story, the herb is called Tu Si Zi, or “rabbit's thread” in Chinese. In English, we call it cuscuta or dodder. 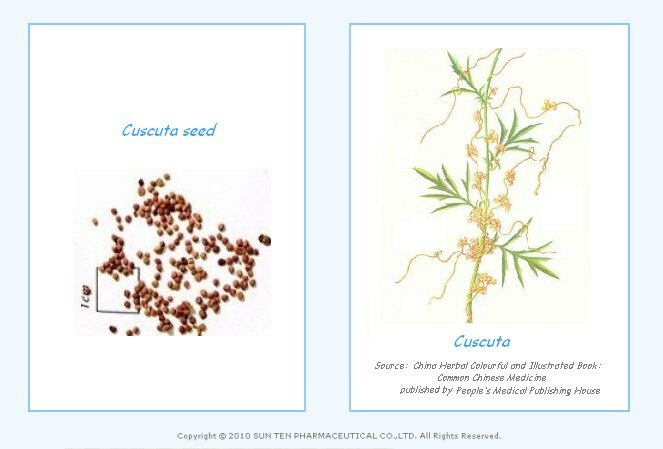 Cuscuta (Tu Si Zi) is the dried ripe seed of Cuscuta chinensis Lam. (Convolvulaceae family). It has acrid, sweet, and neutral properties with slight scent. It enters through the kidney and liver channels. Since it is apt to tonify the Yang, it should not be used for fire from Yin deficiency or in patients with constipation and scanty, dark urine.